Zhanjiang Port processed its 801,400th 20-foot sea container on Nov 22, surpassing its annual goal 39 days before the end of the year and marking a 28.77 percent uptick in productivity year-on-year so far. In the past 11 months, the port has opened seven extra shipping routes, creating a total of 35. Zhanjiang now has seven direct routes to Southeast Asia, which further establish it as a pilot city along the Belt & Road. Meanwhile, four rail-sea combined transport routes have been added to connect Zhanjiang with Southwest China, bringing the port's total to eight, and to create a highly-efficient and low-cost transportation system integrating multiple traffic modes. 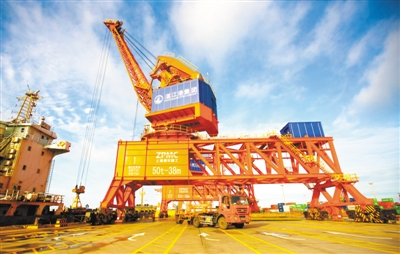 Port operator, Zhanjiang Port Group has repeatedly set new benchmarks in productivity and efficiency in recent years. It is estimated that the annual sea container throughput at the port will reach 900,000 for this year, which is 1.25 times more than in 2016.